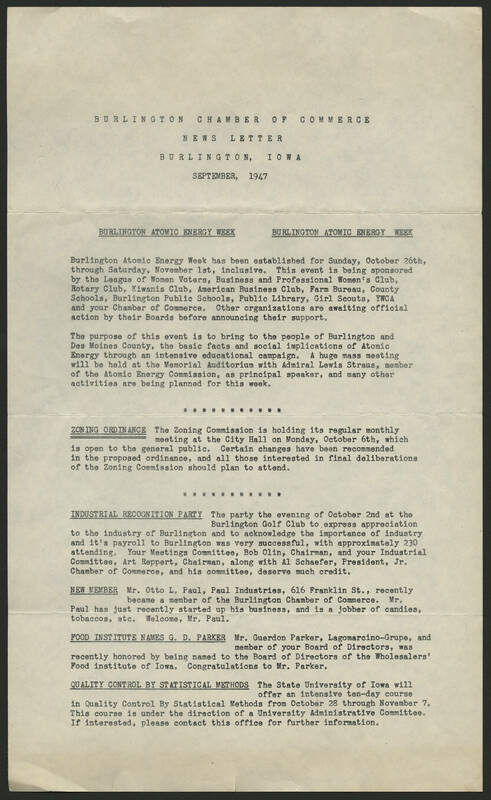 BURLINGTON CHAMBER OF COMMERCE NEWS LETTER BURLINGTON, IOWA SEPTEMBER, 1947 [[underline]]BURLINGTON ATOMIC ENERGY WEEK[[end underline]] [[underline]]BURLINGTON ATOMIC ENERGY WEEK[[end underline]] Burlington Atomic Energy Week has been established for Sunday, October 26th, through Saturday, November 1st, inclusive. This event is being sponsored by the League of Women Voters, Business and Professional Women's Club, Rotary Club, Kiwanis Club, American Business Club, Farm Bureau, County Schools, Burlington Public Schools, Public Library, Girl Scouts, YWCA and your Chamber of Commerce. Other organizations are awaiting official action by their Boards before announcing their support. The purpose of this event is to bring to the people of Burlington and Des Moines County, the basic facts and social implications of Atomic Energy through an intensive educational campaign. A huge mass meeting will be held at the Memorial Auditorium with Admiral Lewis Straus, member of the Atomic Energy Commission, as principal speaker, and many other activities are being planned for this week. *********** [[underline]]ZONING ORDINANCE[[end underline]] The Zoning Commission is holding its regular monthly meeting at the City Hall on Monday, October 6th, which is open to the general public. Certain changes have been recommended in the proposed ordinance, and all those interested in final deliberations of Zoning Commission should plan to attend. *********** [[underline]]INDUSTRIAL RECOGNITION PARTY[[end underline]] The party the evening of October 2nd at the Burlington Golf Club to express appreciation to the industry of Burlington and to acknowledge the importance of industry and it's payroll to Burlington was very successful, with approximately 230 attending. Your Meetings Committee, Bob Olin, Chairman, and your Industrial Committee, Art Reppert, Chairman, along with Al Schaefer, President, Jr. Chamber of Commerce, and his committee, deserve much credit. [[underline]]NEW MEMBER[[end underline]] Mr. Otto L. Paul, Paul Industries, 616 Franklin St., recently became a member of the Burlington Chamber of Commerce. Mr. Paul has just recently started up his business, and is a jobber of candies, tobaccos, etc. Welcome, Mr. Paul. [[underline]]FOOD INSTITUTE NAMES G. D. PARKER[[end underline]] Mr. Guerdon Parker, Lagomarcino-Grupe, and member of your Board of Directors, was recently honored by being named to the Board of Directors of the Wholesalers' Food institute of Iowa. Congratulations to Mr. Parker. [[underline]]QUALITY CONTROL BY STATISTICAL METHODS[[end underline]] The State University of Iowa will offer an intensive ten-day course in Quality Control by Statistical Methods from October 28 through November 7. This course is under the direction of a University Administrative Committee. If interested, please contact this office for further information.